Mommy and I felt like you may enjoy having a few words from dear old Da Da to carry with you into the future. 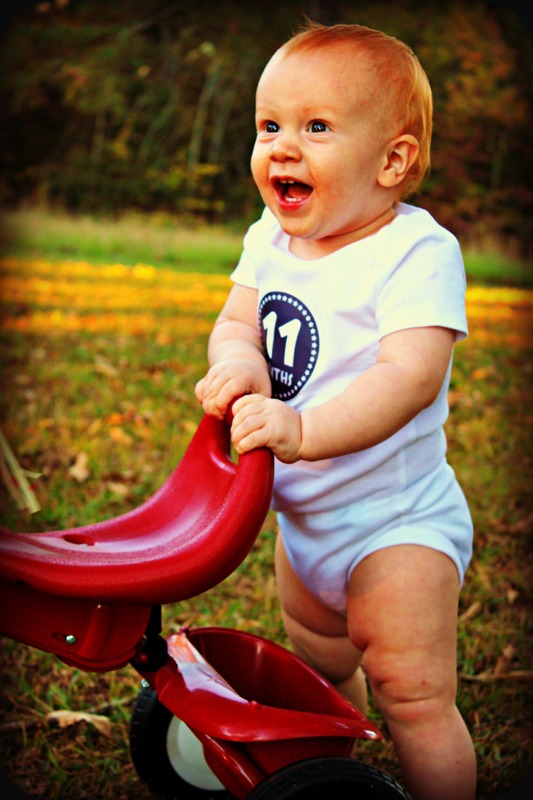 You are 11 months old now Boo Boo- your rockstar personality and your desire to explore are matching one another step for step. I catch your mother staring at you some times (I think shes trying to stop you from growing so fast through some kind of spooky spoon bending super power), but don’t worry, Da Da is there to break her concentration before it has any real effect on you. Oh yea, your getting to be quite the little prankster now. You find dangerous and poisonous things and act like you’re going to hand them over only to yank them back and shove them in your mouth (HAHA). One of my proudest moments came this month when you saw me walk in from work and said, “HI DADA! !” I almost fell over with pride. However, you seem to have really expanded on this new trick, so much in fact that you say “HI DADA” to RJ and… well…..the oven. I’m sure your just practicing for your next genuine DADA encounter so, no worries. I’m keeping my fingers crossed that you will save your first real walking session for the evening when I will be here to cheer you on but, I fear that any second your hands will leave the safety of the nearest object and you will be walking. This entry was posted in A diary for baby and tagged 11 months by themielkeway. Bookmark the permalink. What a nice letter to your son, Ian. We laughed at some of your descriptions. Thanks for sharing. Awe…what a great idea having Daddy write! I love it! !